Please refer to our stock # 1750 when inquiring. Any 2/$59. 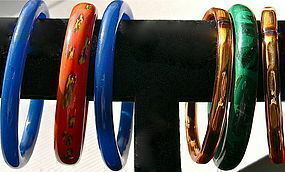 Six vintage glass bangle bracelets. Cross collectible for Far Eastern Peking Bejing Chinese art glass bangle bracelet collectors who love the happy clinking sounds that glass makes! Assorted. Images tell dimension. Please view all images to apprediate. Make these yours today! Ask for combo specials. How they clink! $12 USPS Priority/Ins/Track Signature or FREE with your USA Ck or USPS MO. Really save and take them all for special price - please inquire.